Walgreens will have a bonus promotion going on where you can earn 5,000 points when you purchase $25 worth of items. Note: This promotion ends on 8/12. Plus, there is a $1.00/1 Angel Soft Bath Tissue 12 rolls or more found here (use zip 77477 if needed), there is a $10 Angel Soft Rebate here, you will earn 1,000 points when you purchase each pack of Angel Soft Bath Tissue, and the 5,000 bonus points when you purchase $25 worth. 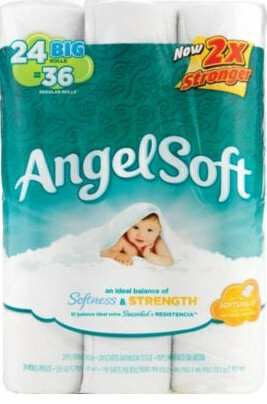 Get 3,000 points for purchasing three packs of Angel Soft and 5,000 points for the bonus coupon = $8 back on your Balance Rewards card. Then, upload your receipt here to earn back $10. That breaks down to just 8-cents to 10-cents per roll! That’s an AWESOME price for bath tissue!